For whacking and stacking swine, nothing delivers like our new Hog Hammer. It penetrates even the thickest-skinned pigs with a Barnes TSX Bullet at its heart. With all copper construction for 28% deeper penetration than standard lead-core bullets, it's the toughest expanding bullet on the market, offering near 100% weight-retention on-hog, while expanding rapidly to deliver devastating wound channels. Hog Hammer utilizes a flash-suppressed propellant for nighttime or low light hunts, and uses nickel-plated cases for reliable feeding in today's hog rifles. Available in seven calibers, including 450 Bushmaster. Hog Hammer. 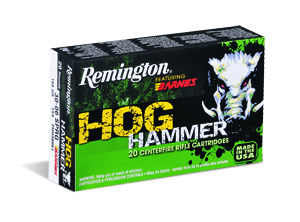 Full-boar annihilation only Remington can provide.